Moana is Now in Theaters! Peyton and I have been anxiously awaiting the release of Moana. The wait is OVER! Moana opened nationwide today at theaters everywhere. We were fortunate enough to have seen the movie last week and I have been dying to share our thoughts with you. But I couldn’t, until today. Moana is awesome! Peyton gave it two thumbs up. I do have one warning, this is a longer movie. I believe it runs just shy of 2 hours. So with that being said, be sure your child can sit through it. And you may want to limit beverages so little ones do not have to use the bathroom during the movie. I must admit I am a huge fan of mythology and when I saw Disney was going to make a movie with Maui (Demi-God)and Te-Fiti (Nature Goddess) I knew I just had to see Moana. 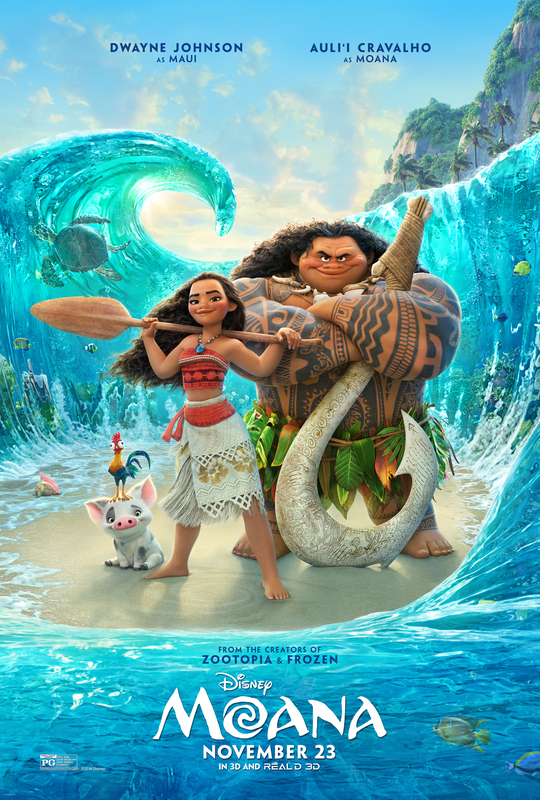 Disney did a wonderful job taking Polynesian mythology and creating a story line that will inspire children to be their own person and find themselves. Moana starts out with us seeing Moana when she was a baby. How she had a strong will and curious character. We also see the moment the ocean fell in love with Moana and chose her to restore the rift between Te-Fiti and Maui. Over the years, as Moana grows up we see the struggle between her passion to explore the ocean with her father’s desire for her to stay on the island. Until one day, Moana could not ignore the calling any longer. The rift between Maui and Te-Fiti happened when Maui stole Te-Fiti’s heart. Once her heart was stolen she went dark. Where there was once green plants and life became dark and uninhabitable. The plants shriveled up and the animals died. The longer Ti-Fiti’s heart was missing the more death and destruction spread. It was the story Moana had heard time and time again growing up. And that one day, the chosen one, would sail the ocean, find Maui and demand he restore Te-Fiti’s heart. Moana’s father dismissed this legend as a story and paid it no mind. Then one day, the harvested fruit was rotten and the fish had disappeared. All the fishing traps were coming up empty. The curse had spread to their island. It was at that moment Moana knew what she had to do. She set out on a mission to find Maui, make him restore Te-Fiti’s heart and save her people. We watch Moana journey through the ocean to fulfill her destiny. The destiny the ocean had chosen her for when she was baby. Peyton loved watching Moana sail the ocean and make Maui return the heart of Te-Fiti. The storyline is really well written and keeps the whole family engaged. The time flew by and when Moana was over I wanted more. I really loved Moana and wanted to a part of her world for a little while longer. If you are looking for a film to see this holiday weekend I strongly encourage you to go see Moana. Peyton and I both enjoyed Moana and I’m sure your family will too! On Saturday, Peyton and I are heading to Disney World in hopes of finding Moana. Keep an eye on our Instagram account to see if get to meet Moana. I heard she’s been hanging out at the Polynesian resort. I bet this will be a good one! I love these animated movies as much as any kid, lol.